2 sacs... 2 kids... yay! Today we did the official handoff from the fertility doctor to the normal OB. One of the things that has been a point of stress since doc1 told us we were having twins was the wait-time between ultrasounds. 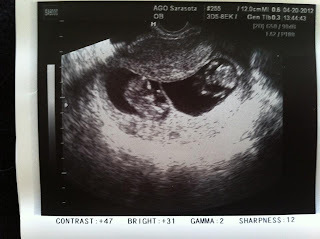 I work hard to trust God with the handling of the twins, but you know when the doc is probing your wife, you just can't wait to see the two heartbeats again. I lay in bed at night thinking: man, I just can't wait to meet them and love on them. With twins, we are considered high risk so there will be an office visit and ultrasound every two weeks. Now I see this as a bonus because of the extra level of care, but that I get to see the kiddies every two weeks. Cool, huh?